Our perceptions create our reality. These perceptions are the illusion we create that we believe is our reality. What type of illusion are you creating as your reality? Our personal realities are an illusion created by our beliefs, opinions and understanding. Our realities are the experiences we’ve had; the situations we’ve been in; and what we accept from others including society, family, the government, family, friends and loved ones. 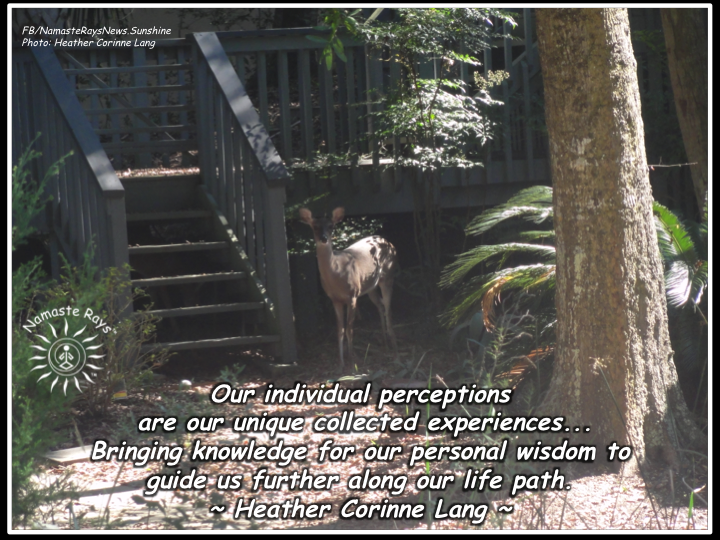 Our individual perceptions are our unique collected experiences…Bringing knowledge for our personal wisdom to guide us further along our life path. Reality in essence is a perception of our current knowledge. What is your perception telling you? Does this perception create havoc in your life? Or harmony? Is this perception of reality serving your highest good or are you ready to break the illusion which is not helping you on your life path? Body pains, emotional pains, mental pains and spiritual pains are all derived from this perception of reality. This illusion of what we, as individuals believe and know to be our truth, but also what has been passed down for generations into our cells & DNA, our souls and what we have learned each lifetime or through this current lifetime. Using our current knowledge, we can delve deeper and find our inner wisdom from the experiences. This inner wisdom comes from healing the wounds we have from our life, our former lifetimes and the generational learned behaviors, thoughts & opinions. When you start to understand where these wounds come from, the healing begins. This healing brings us further along our path to a different understanding, a different perception and thus, a different reality. This new reality is still our illusion, but it’s part of our path to continue learning and growing. Knowing you are creating your reality, you are able to recognize that others have their reality. Understanding we each have these unique experiences as part of our individual souls, we can accept another’s reality as their own, without adopting it for ours. We can accept that someone else is on another path for their highest good, just as we are on ours for our highest good. We can better understand the differences between people, no matter if their beliefs, opinions and thoughts are very different from our own. Different isn’t better or worse. It’s just different. Knowing “it’s just different”, helps us realize and recognize that although individually different, the Light and Love still exists within everyone. And, this allows us to not attach to something which doesn’t fit with our inner truth, allowing all of us to live in harmony. May your uniqueness guide you on your path in harmony with all. Thank you, Alexander! All is great…hope you had a great Thanksgiving and you and yours are healthy & happy!